With a super easy construction based on a rectangle, this free crochet sweater pattern is playful, fast and perfect for beginner to advanced crocheters. You’ll love watching it come together with zero increasing or decreasing! Get the free pattern + video below or purchase the ad-free, printable PDF with stitch chart for $2.99. The Haven free crochet sweater pattern is part of an collaboration with Lion Brand Yarn. This post contains affiliate links. Quick working, luxuriously chunky yarn and a playful bobble stitch come together to make a crochet cardigan that will feel like a haven from the winter chill. Read all the yarn and pattern details below or scroll down for the entire free crochet sweater pattern. This is the Yarn We’ve Been Waiting For! If like me, you have little patience for projects that progress at a snail’s pace, but also love some beautiful stitch definition, you are going to LOVE this new yarn from Lion Brand. It’s called Color Made Easy and as a category 5 weight yarn, it falls right between worsted favorites like Heartland and bulkier standbys like Wool-Ease Thick & Quick. I’ve started to think of the rare category 5 yarns like this as worsted weights on steroids. They make projects progress faster and give them that chunky, luxury look, but the yarn still feels very different than the straight up “chunky” yarns that we all turn to when we need to bust out an entire project in four hours. And the colors of this yarn!? Well, they definitely live up to the name. You can see the entire line of colors of Color Made Easy yarn here! I tend to be sort of an impulsive project starter, so having access to great yarn at my Michaels store may not help shorten my list of WIPs, but it sure makes a trip to buy art supplies for my kids extra fun! I’m so excited about this fantastic new yarn option that I’ve designed two additional free crochet patterns using Color Made Easy to share with you over the coming weeks. 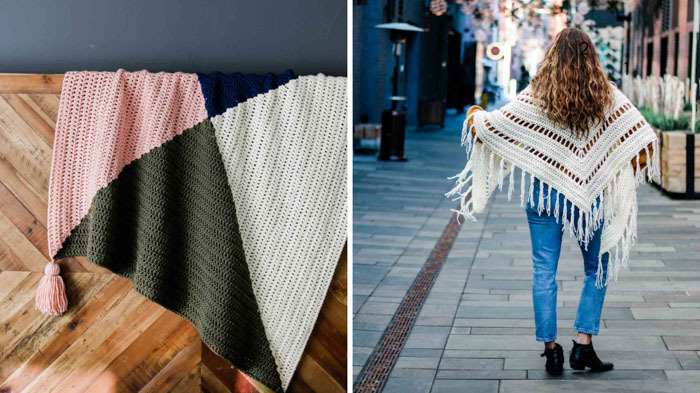 Stay tuned for a modern tasseled blanket (great for babies or your couch) and a chunky, fringed triangle shawl that will tickle your inner bohemian (both pictured below). 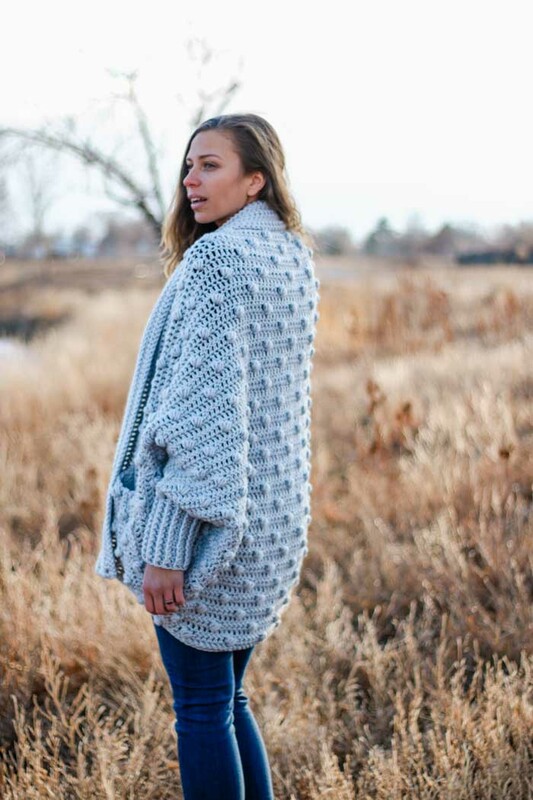 First though, let’s talk a little more about the new Haven Cardigan pattern! An Entire Crocheted Sweater Made from a Rectangle? Say What? To me, this is one of those perfect projects that hits the sweet spot between mindless and mind-numbing. 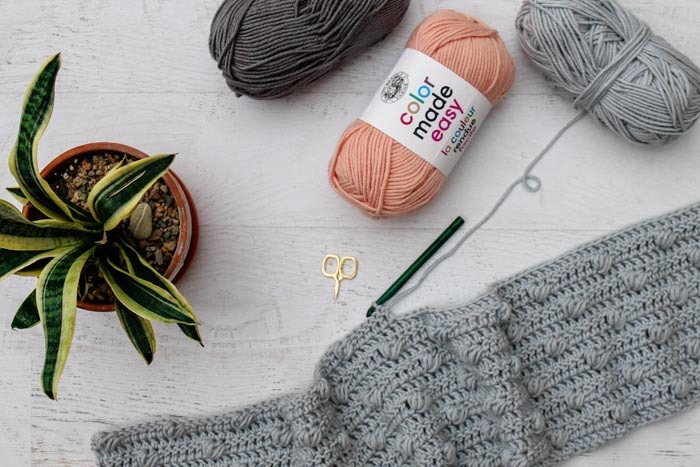 The bobble stitches will keep you just interested enough, but the simplicity of the project overall means you can work on it on car rides and while binge watching Marie Kondo’s Tidying Up. 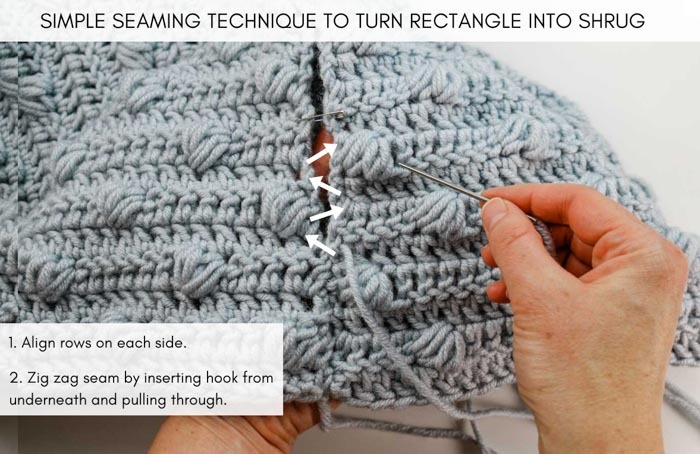 If you’re more of a beginner crocheter, please don’t be intimidated by the scope of making an entire sweater. This is a perfect first garment project to try. The thicker yarn and super easy construction make this crochet sweater pattern way faster and easier than it looks! 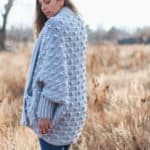 Plus, you can follow the step-by-step video tutorial to learn how to make a Haven Cardigan right alongside me. 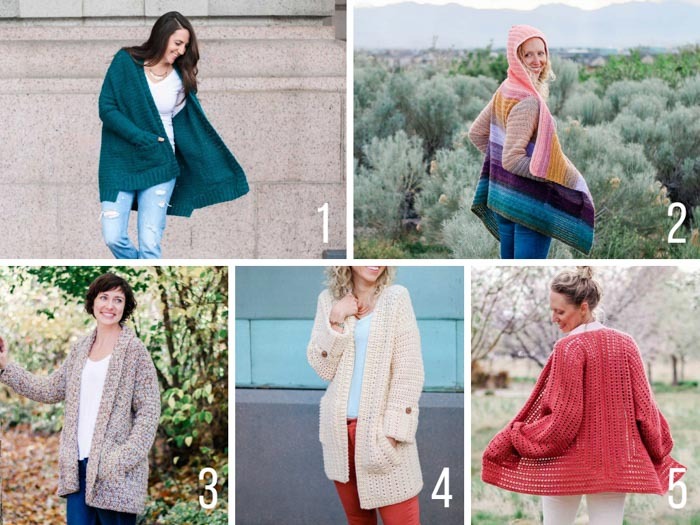 If you’re interested in more free beginner crochet sweater patterns made from very simple shapes, here are a few of the most loved by M&DC crocheters. As a visual learner myself, I always want to find ways to help less-experienced pattern readers. 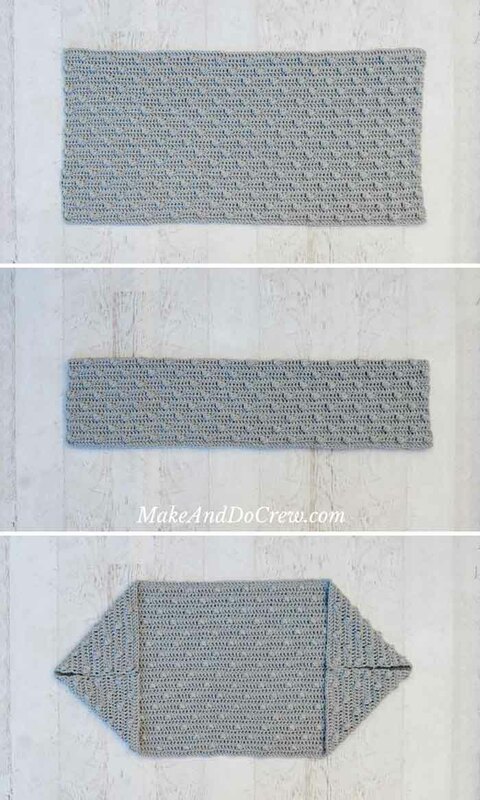 For this crochet sweater pattern, I suggest grabbing the ad-free PDF because in addition to being easy to print, it includes two really helpful tools for beginners and visual learners. Secondly, the PDF also includes a stitch chart for the bobble stitch pattern, which for me, is a FAR easier way to understand a crochet stitch repeat than reading a written pattern. If all that sounds good to you, you can purchase the PDF here. And lastly, below, I’ve created a quick video tutorial of how to work the crossed cluster stitch used in this pattern in case it’s easier for you to understand than reading the written instructions. 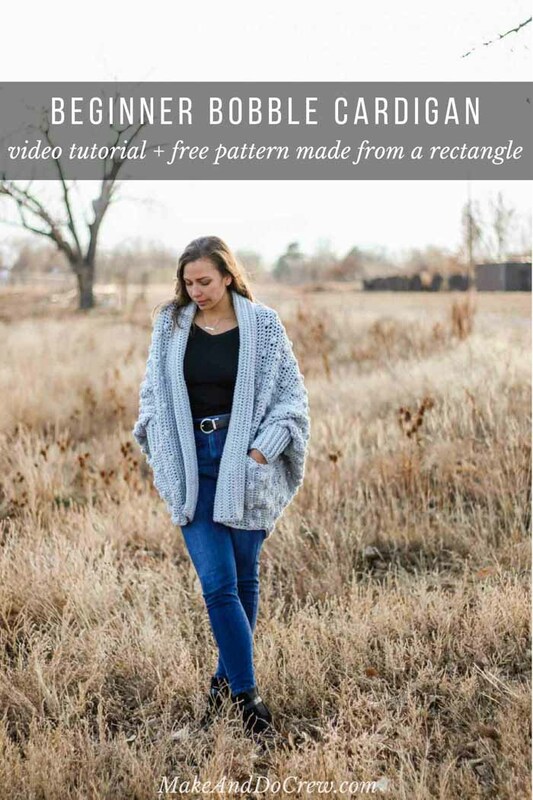 If you’d like me to walk you through the entire pattern step-by-step, check out the complete Haven Cardigan video tutorial here. 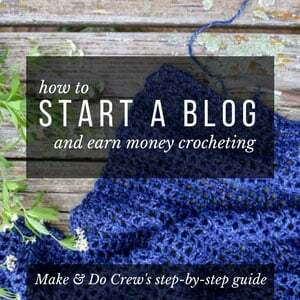 Skills required include double crochet, bobble and post stitches and basic seaming, all of which is covered in the upcoming video tutorial. 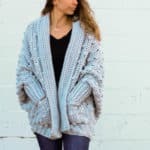 YOU can make this on-trend, comfy cardigan! See chart in printable PDF additional measurements per size. Sample pictured is a M/L on a 5’9” model with a 38” bust. • Pattern is written for size S/M with M/L, L/1X, 1X/2X, 2X/3X written in parentheses: S/M (M/L, L/1X, 1X/2X, 2X/3X). Sample shown is size M/L. 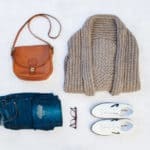 Because of the oversized style of the sweater, choosing a size is less about exact chest size and more about how loose you want your sweater to fit. • If you’re a visual learner, check out the stitch chart at the end of the pattern PDF as it can be extremely helpful in making the stitch repeat easy to comprehend. • Ch-3 counts as first dc throughout. • The first cluster of the 2CC following a ch-3 is difficult to work into. Pattern compensates for that by working an extra dc at the beginning of the next row (by not skipping first dc) so stitch count can remain consistent. Stitch chart at end of pattern reflects this option. If you prefer to find and work into this st, skip the first dc on each and every row. • Each row of crossed clusters will align with the row three rows down. Use this regularity to double check your work if you’re unsure of cluster placement. • Recommended Foundation Row is worked in foundation double crochet stitches because they are much easier to crochet into versus working into a long chain. If foundation double crochet intimidates you, use Alternative Foundation Chain followed by Alternative Foundation Row 1. • See video tutorial in blog post above for visual instructions on the 2CC stitch. Note that although Rows 3 and 5 are both double crochet, they differ in that Row 3 doesn’t skip the first stitch and Row 5 does skip the first stitch. Alternative Foundation Chain: Ch 102 (110, 118, 126, 134). Rep Rows 2-5 another 8 (9, 10, 11, 11) more times to create a total of 37 (41, 45, 49, 49) rows. Fasten off leaving a 25” tail. Finished dimensions of rectangle should be approx. : 23.5 (26.5, 29, 31.5, 31.5)” tall by 40 (43, 46.5, 49.5, 53)” wide. Fold rectangle in half with RS (bobbled side) facing out so that the foundation row and the final row of the rectangle are touching. Stripes should be running horizontally as in three-photo series above in blog post. Pin in place along side seams using stitch markers or safety pins. Take care to line up stripes. Using a tapestry needle and a doubled-over strand of yarn or existing yarn tail, begin seaming the rectangle, working from the open side to the folded side. See photo below for seaming technique. Stop when there are a total of 14 (15, 15, 16, 16) rows unseamed. This will become the armhole. Repeat on second side. Lay your new shruglette as pictured in photo C with foundation row at bottom and final row at top. Counting downwards from seam, PM in 30th (32nd, 35th, 37th, 40th) st of foundation row. Counting downwards from seam on opposite side, PM in 30th (32nd, 35th, 37th, 40th) st of foundation row. Right-handed crocheters: With WS facing, attach yarn in st with right bottom marker. Left-handed crocheters: With WS facing, attach yarn in st with left bottom marker. 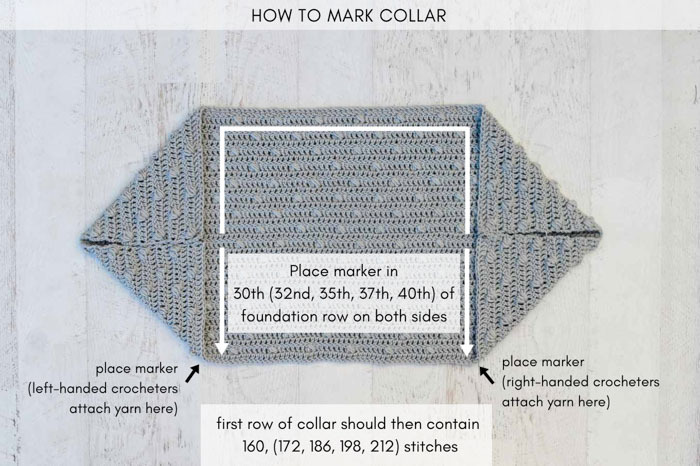 • Each collar row is worked between both stitch markers, beginning in marked st in the direction of first seam, continuing along entire final row of main rectangle toward second seam, and finishing in marked st on opposite side of second seam. Because stitch counts per size differ, please note the instructions for the size you’re making when determining whether or not to skip first stitch in Row 2. When working Row 1, take special care to work into each st on either side of seams (but not into the seam). Doing so should ensure that each crossed cluster lines up with the crossed cluster 3 rows down (in main rectangle). Verify crossed cluster placement to double check your work. Row 4 (RS): Ch 3, do sk first st, dc in next and each st to end, working last dc in top of tch; turn. Rep Rows 2-5 once (once, once, twice, twice) more. Rep Rows 2-4 once more to create a total of 12 (12, 12, 16, 16) rows. Final row should be a RS row. Without fastening off, rotate sweater so that bottom border can be worked with RS of sweater facing. Row 1 (RS): Ch 1, sc evenly across bottom of sweater, taking care that fabric is not rippling or getting pulled to tight. Fasten off at end of sweater bottom. • Sleeve ribbing is achieved using post stitches. Please reference glossary of the pattern or the upcoming video tutorial for additional help. • Ch-3 at the beginning of each round counts as the first dc. In the post stitch pattern, this dc will represent a bpdc despite the fact that you can’t actually crochet around the post of a ch-3. Fasten off and weave in ends. Repeat for second sleeve. • As in main rectangle, two options are given for foundation row. Work only one. • Ch-3 counts as first double crochet. • When making slip knot to attach yarn to hook for Foundation Row, it’s helpful to leave a 25” tail so it can be used later for seaming. • If you’d prefer a wider pocket, work an additional repeat of Rows 2-5. Prefered Foundation Row (RS): Fdc 20. Alternative Foundation Chain: Ch 22. Rep Rows 2-5 once more. Fasten off leaving a 25” tail. • Last row of pocket should be closest to edge of collar so that direction of pocket stitches matches direction of collar stitches. • Crossed cluster stitches on pocket should align with overall pattern of collar. This means all crossed clusters on pocket should have a crossed cluster bobble on collar directly behind it. Using tapestry needle and leftover tail of pocket, whip stitch around three pocket sides, leaving top open. Repeat process for second pocket. Wrap up in your new handmade hideaway and don’t come out until the summer sun does! Hi , I was wondering if the following links were still available . When I tried to access them I was taken to your page and an error 404 came up for both links . Sorry to be bother , its just that I was interested in viewing the patterns . So, is it DO or DO NOT skip the first stitch? Great question. It depends on your size. So just like how you reference the first description/number for size small, the second for size medium, etc, you’ll do that here. Whichever size you’ve been following within the pattern, follow that same description in this sequence. (So you’ll only do one–either DO skip it or DON’T skip it, depending on your size.) Does that make sense? I can’t wait to see your photos. I hadn’t thought of using Scarfie, but I bet that will be lovely! I just wanted to say that I absolutely adore your crochet patterns, they’re all soft squishy, chinky and oh so cozy! Thank you so much for taking the time to share them with us. 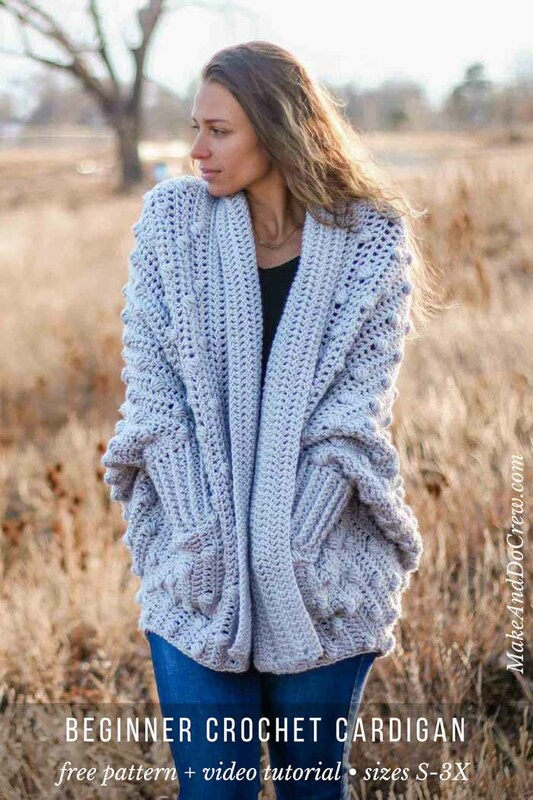 I love this sweater and want to make it but when reading the pattern, I don’t understand this portion and don’t see any photo explanation. Can you clarify regarding the collar? This simply means that you’re working into the stitches on either side of the seam, but not the seam itself (as this would add extra stitches to the row that shouldn’t be there). The second part of that note means that you can look at the crossed clusters to make sure they’re lining up with the rows below as they’ve lined up in the pattern throughout. This is a way to just visually check that you’re on the right track. I’m very confused by your collar instructions. Are there two different collar options? 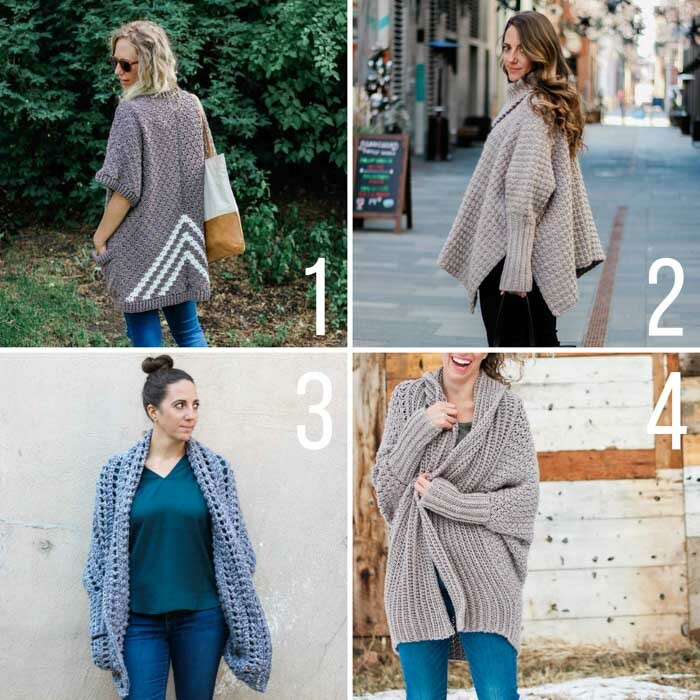 It seems like the CC stitch is used in one instruction but then when I look at the photos the example sweater does’t have any CC in the collar. Further down I see what seems like collar instructions for DC? I purchased the pattern hoping there would be more clarification but there isn’t. I don’t want to start the sweater until I feel I understand it. I hope you do a video for this. This is definitely not beginner friendly. There are two parts to the collar, first you work some rows in crossed clusters and then you finish with rows of just basic dc. Both are outlined in the “Adding Collar” section. Hope that clears things up! I love your sweater. It’s beautiful! I can’t wait to make it. Congratulations on the new baby. I love your work.